Viso3D Exporter v1.2.0 has been released! This is a free update for existing users. The exported SketchUp model is now an .xcs file and can be opened on any iOS device, given that the device has enough memory to open and display the 3D model. There are easy ways to distribute the .xcs file from your Windows or Mac computer to an iOS device. Email the .xcs file as an attachment to you or your client and have them open the e-mail on their iPad or iPhone/ iTouch. 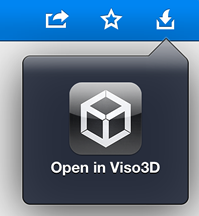 When the .xcs attachment is highlighted or selected, use the "Open In" menu to open in Viso3D. There are several 3rd party web server based file management systems for the iPad such as Dropbox, Box and others. These are excellent ways to distribute your .xcs file your iPad or to your clients. For example, Dropbox will download the .xcs file. Dropbox itself can not open the .xcs file but you can use the Open In icon to open the .xcs file in Viso3D. Even if you are a Windows user, if you have an iPad, your official connection from your PC to the iPad is iTunes. You can transfer .xcs files from your Windows (or Mac) computer to the iPad through iTunes. Connect the iPad to your PC or Mac. This action brings up iTunes. In iTunes’ select your iPad icon. Then click Apps. Scroll down until you find the File Sharing section. Here you will see a list of all the apps that can accept files. Select Viso3D. In the box to the right, you will see the files currently stored by Viso3D on the iPad. Open Windows Explorer or Mac Finder to the folder containing .xcs files you want to move, and drag the files to that iTunes box. Press the Sync button in the bottom left of the screen.